Back when I was a grad student in New York City, I’d frequently stop in at the Abbey Tavern after night classes, where Irish bartender Austin would pour me a perfect pint of Guinness. It was my reward for enduring endless seminars, months of anthropological fieldwork, master’s exams and a never-quite-finished Ph.D. dissertation. Guinness aficionados I knew always swore that the Abbey served up some of the “freshest” Guinness in town. I wasn’t discerning enough to know whether that was true or not; I just loved the silky, sensuous sensation of a not-too-cold Guinness sliding down the pipes. In more recent years—in part, for supposed health benefits—I’ve shifted mostly from beer to wine. The jury is out on those health results, but it’s still hard for me to pass up a freshly poured Guinness, which is one reason I occasionally find myself at MacCool’s with my mitts wrapped around a cool Guinness draft. Recently, I attended a Guinness dinner where Guinness products were paired with various dishes from MacCool’s ace culinary team. Irish pub food, this was not. I know what you’re thinking: “Guinness with dinner? Isn’t that a bit much?” A lot of people think of Guinness as “heavy” beer. There’s a common misconception that it’s high in alcohol and heavy on the palate. Nothing could be farther from the truth. As Guinness quality manager (how’d you like to have that job?) John Baxter pointed out, Guinness draft is, in fact, 3.2 beer, which is how it is served on tap in many of our better bars and restaurants. And it’s not cloying or tongue-coating, in the way that, for example, some strong Porters might be. So as it turns out, Guinness is a darned good choice for certain dinner dishes. However, it’s not just for dinner. One of my favorite local brewmasters swears by Guinness for breakfast. And, I have to confess, I have had a glass of Guinness with pancakes a time or two. Here’s a fun fact: The biggest selling beer in Ireland is—wait for it—Budweiser. 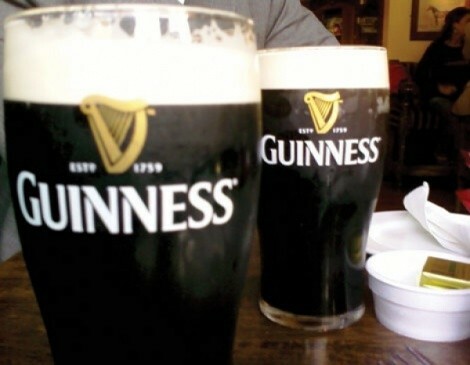 More Guinness on tap is sold in the United States than the Emerald Isle. In fact, we’re Guinness’ biggest consumers. But the Guinness folks make more than just Guinness and, at MacCool’s, dinner kicked off with glasses of Harp lager and Harp-marinated sea scallops, grilled endive and a citrus salsa. The crisp, slightly fruity lager worked beautifully with the delicate scallops and acidic salsa. That was followed by an onion soup “medley,” made with four types of onion, and paired with Smithwicks amber ale. From the Guinness guys, I learned I’d been mispronouncing Smithwicks. It’s pronounced “smidix,” with an accent on the first syllable. Apparently, the “th” and “w” are silent, plus there’s a hidden “d” in there. Who knew? Another thing I learned: All Guinness draft is the same. Sure, it might be a little fresher in Ireland than here. But, it’s all the same, and it’s all made in Ireland. So, the Guinness you get at MacCool’s or your other favorite American pub is exactly the same stuff served in County Cork. That’s not true, for example, of bottled Guinness Extra Stout. But the draft all comes from Ireland. How it’s poured (gently, for starters), temperature (ideally, stored at 38 degrees and served at 42) and the type of glass used—preferably a fluted Guinness glass; wide in the middle and tapered at the bottom—all matter, according to John Baxter. He, by the way, was very impressed by the way MacCool’s handles and serves Guinness. Some other places, not so much, but they’ll remain nameless.